The Blusher mushroom has a reddish-brown convex cap. The cap is 10 to 15 centimeters in diameter when mature. The gills on the underside of the cap are are white and free of the stipe. When the gills get damaged they display red spots. The spore print is white. The stipe is white with flashes of the cap colour and grows up to 15 centimeters tall. the ring has ridges on it's top side, a feature distinguishing it from from the Amanita pantherina, a poisonous mushroom. 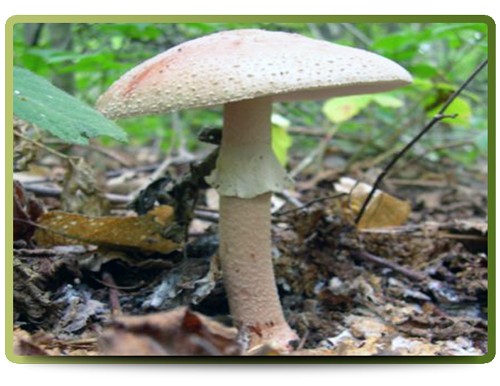 The Blusher mushroom has a mild taste when uncooked and has a acrid aftertaste. The mushroom's white flesh bruises slightly pink when handled or exposed to air. 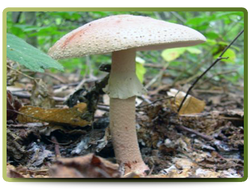 The Blusher mushroom is found growing on poor soil and in woodlands.